I’m not even going to beat around the proverbial bush today and say that this is probably one of the reviews I have been looking forward to most this year; that says a lot because I have seen a ton of fantastic products over the last 12 months! When I think of enthusiast grade motherboards, I instantly think of heavy hitters like the ASUS Rampage Extreme, MSI XPOWER, and even the ASRock Extreme11, but nothing really prepared me for what I have on the test bench today; an X99 ITX motherboard! 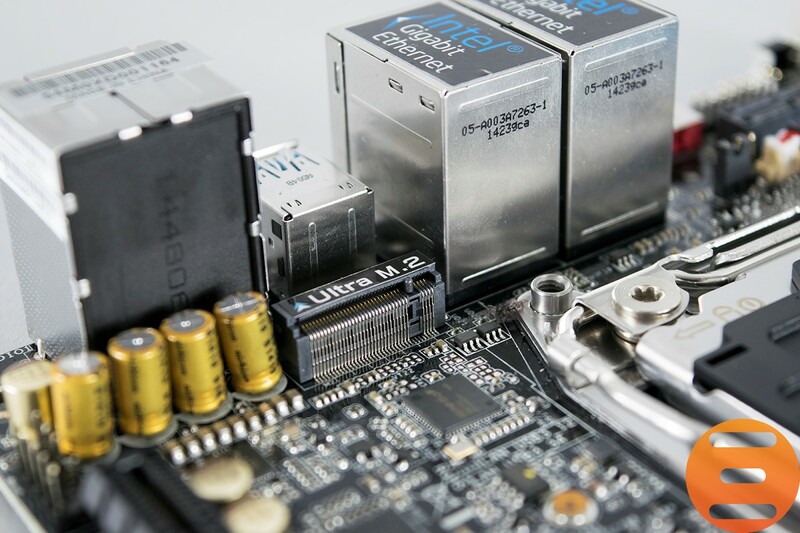 Yes that is correct, ASRock have broken the mould and released a much anticipated ITX motherboard which is a world first for DDR4 support and of course Intel’s X99 (Haswell-E) chipset; something totally unheard of. On the last enthusiast platform from Intel (X79), the smallest we got given was M-ATX by ASUS in the shape of the ROG GENE range and even then, finding one was like trying to pull a hens tooth; virtually impossible. That, however, is a thing of the past and companies have pushed the envelope; ASRock more than most today with the little gem I like to call, “The SFF Monster”. 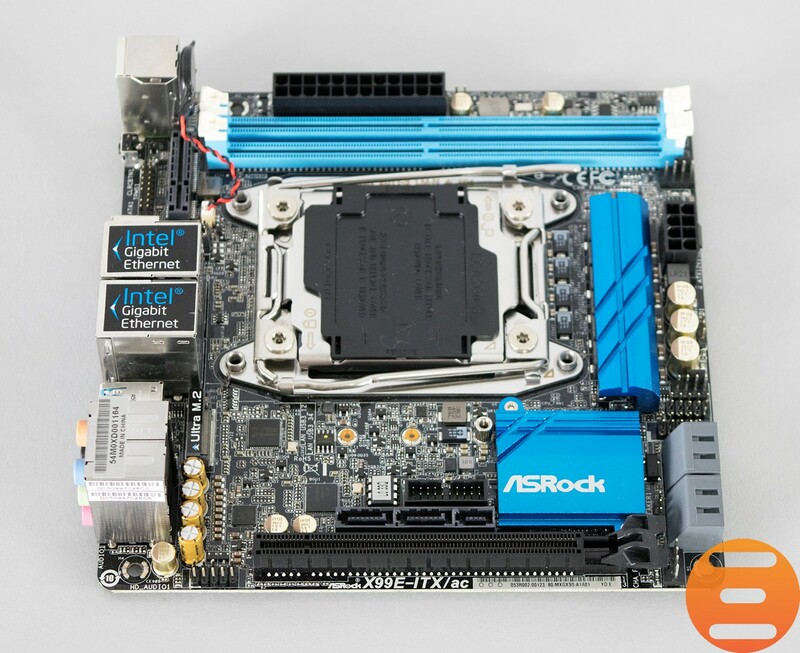 Enter the ASRock X99E-ITX/ac, the world’s first and only X99 M-ITX motherboard and what a feast all you small form factor nerds will have; dual channel DDR4 support, the latest Haswell-E CPU support which includes the monstrous Intel Core i7 5960x 8 core beast (socket 2011v3), built in Wi-Fi support via the integrated 802.11ac module with 2.4/5GHz support and of course, the brand new USB 3.1 Type A is support with up to 10GBs of bandwidth; the next generation of USB. 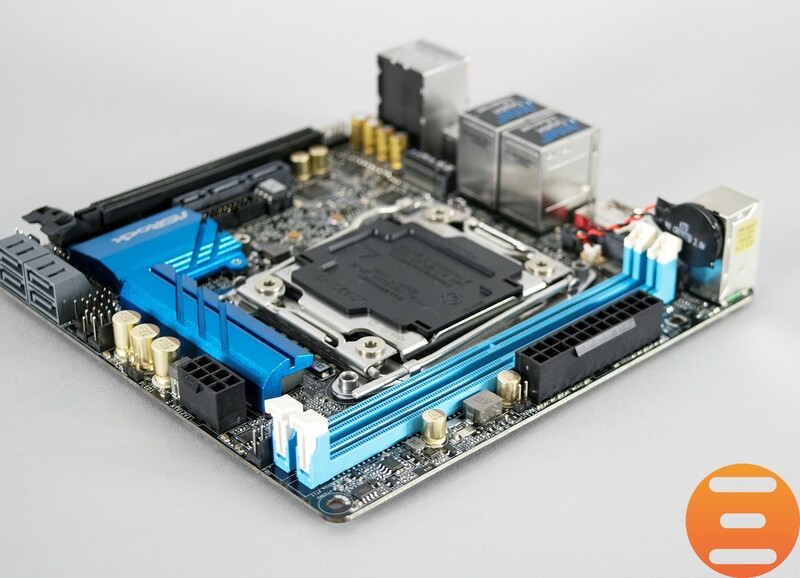 Without drooling all over it, here we have the ASRock X99 ITX motherboard in all its glory; a beautiful little board if you don’t mind me saying! 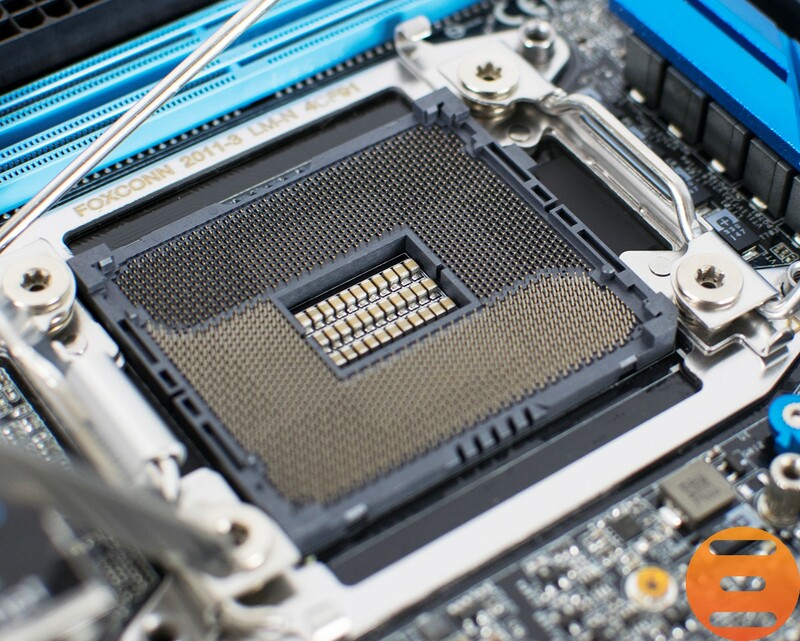 It has piercing blue heat sinks with a fully black PCB and a very interesting layout to say the least. The dinky powerhouse has 2 x SATA 6GB/s ports directly above the PCI-e x16 (Gen3) slot with a single SATA Express port directly next to these; a weird place to have cables trailing from but given the size of the board and its function, this is slightly forgivable. Another interesting thing is the 24pin ATX motherboard power connector; this is actually found at the top of the board and not on the right-hand side seen on a conventional motherboard; in fact the 8pin 12v and 24pin have effectively switched places so bare that in mind when looking to purchase this board. A front panel USB 3.0 header is also featured and can be found directly above the PCI-e x16 slot along with those SATA connections I previously mentioned. Certain sacrifices have to be made when cutting down on PCB space and one of the casualties is, of course, the DDR4 quad channel format; the ASRock X99E-ITX/ac only supports dual channel DDR4 which poses some problems in my opinion; firstly literally all if not all DDR4 memory kits come in quad channel kits and another is, will dual channel take a performance hit; this should be negatable at best but performance is performance at the end of the day, this will be ironed out in the testing. For overclockers, this board has the “OC” socket which features extra pins enabling much better overclocks on the cache; not really a selling point for 24/7 conventional use though, more of a sub-zero overclocking feature in my eyes. It is also worth noting that this board has a 6 Digi power phase design which is certainly not a bad showing in my opinion; should make overclocking pretty interesting in all fairness! 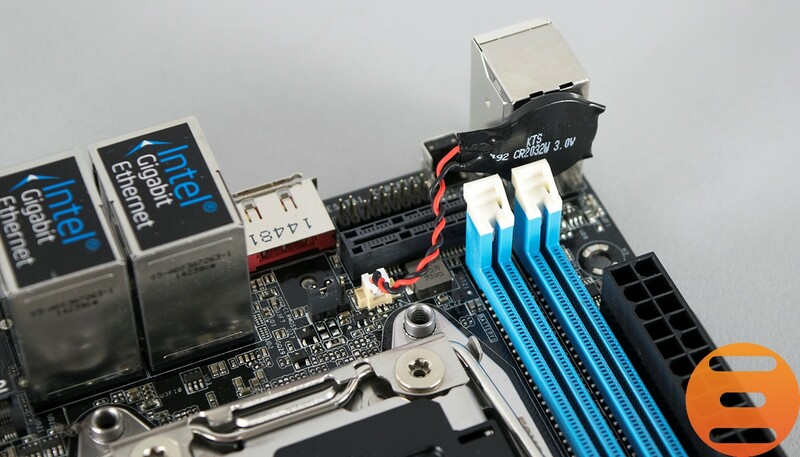 With space constrictions being a common factor on ITX boards, the BIOS battery actually sits in an upright socket with a pretty unsightly red and black cable connecting it to a motherboard header; surely a blue/black cable might have been a better choice or even sleeve it? This is, of course, not a budget board and should be known that X99 demands nothing short of the best in my opinion. ASRock are well known for using top quality parts on their motherboards and with the addition of gold Nichicon (Japanese) audio capacitors, this should enhance the quality of the onboard audio; don’t expect it to rival dedicated sound cards though, they are catching up but not quite there yet! They even managed to squeeze a M.2 SATA port into the fray which sits just below the socket; quite an amazing feat of engineering you might think? Gavin approves! Last but not least, we have the rear I/O which has a very interesting array of ports; it’s much easier to list them below! 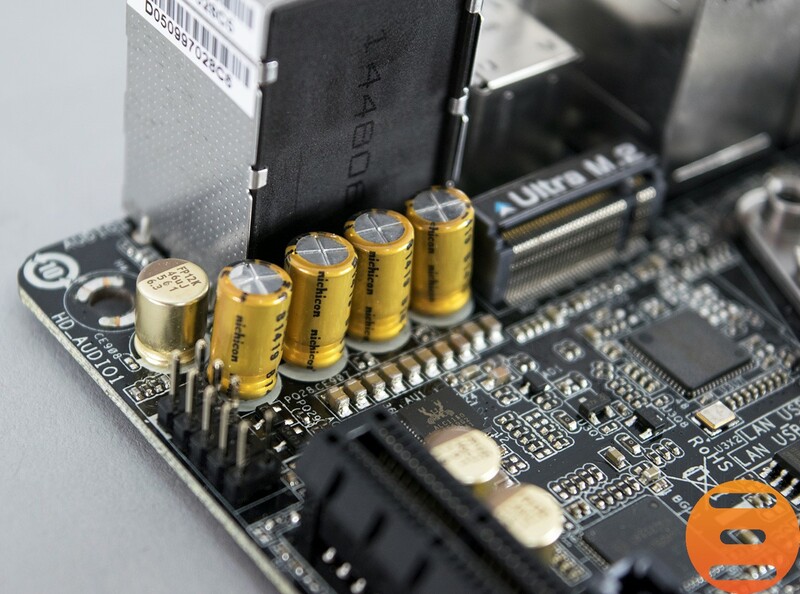 This board features the latest 10GB/s capable USB 3.1 Type A connections which not only future proofs the motherboard, but also shows how serious ASRock are in giving the best possible performance on such a small PCB; always a great thing in my book! The new BIOSTAR Racing Z370GT6 provides the popular features you expect as well as some you might not in a budget bundle that includes the AM3 mouse. Check our review here.